GPS Route Finder - GPS, Maps, Navigation & Traffic enables & Locate your friends on a Map, Navigation Finder Let friends find you. View friend's GPS Route Map location on the map. Google Maps Highly Traffic areas on Map and save your time. 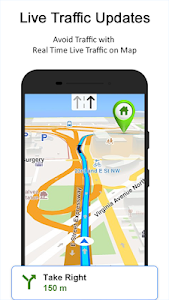 GPS Route Finder - GPS, Maps, Navigation & Traffic with variety of Features such as GPS shortest Route finder, Driving route, Current Location, Navigation, Directions, Map Location Finder Sharing Location with Friends and Family. No.1 GPS Route Finder - GPS, Maps, Navigation & Traffic Family Locator GPS Tracker Find you Nearest Best Places. GPS Route Finder - GPS, Maps, Navigation & Traffic Offers Real Time Location Data. Plan family gathering with family tracker & get arrival time. 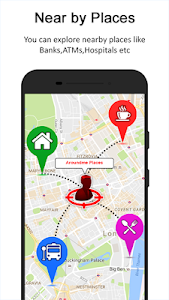 Find Your Nearest Places Family tracker alerts you family members location. GPS Maps, Navigation & Traffic offline map navigation. 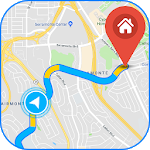 Free GPS Route Finder - GPS, Maps, Navigation & Traffic app that combines the best of offline & online features to create ultimate navigation experience. GPS Route Finder - GPS, Maps, Navigation & Traffic Use GPS Maps. Experience the best Maps, Offline maps to search, get directions & navigation and Street View Live. Maps navigation helps find best fast route to save time in the global world. accurate driving route & shows speedometer on normal route. GPS Route Map, Location Navigation Finder, Directions, Find Places You, Driving Tracker, Your Nearest Best Places. Route Finder Helps you to find distance and traveling time, shortest path. Route Finder helps in Navigation on Maps. 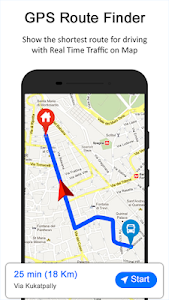 Share your location with anyone, GPS Route Finder allows you to share your current location with friends. Get nearby places ATM hotels. Very accurate speed by using GPS Speedometer. 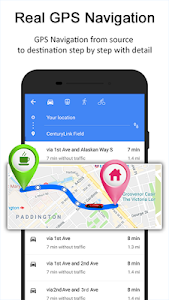 ✔ Find GPS Driving Route, Walking Route & GPS bicycle Route. ✔ Navigation: route navigation, map location, Tracker ,GPS coordinates. ✔ Best GPS Route Finder - GPS, Maps, Navigation & Finder Traffic. ✔ Offline - offline maps you save mobile data. ✔ Traffic information - live and accurate traffic & street view live. ✔ Shortcut - Navigation shortcut, navigate to Home & Places. ✔ Offline maps and Navigation. ✔ Voice GPS navigation with directions & street names & Locations. ✔ Real-time route sharing with Route Finder. ✔ GPS navigation with walking directions & Navigations. Download GPS Route Finder - GPS, Maps, Navigation & Traffic now ! Similar to "GPS Route Finder"